The Wynn Golf and Country Club is an 18-hole, par 70, world-class golf course totaling 7,042 yards. The course is comprised of 5 Par 3s, 10 Par 4s and 3 Par 5 with 11 of 18 holes encountering water. The greens on the course are Pennlinks Bentgrass built to USGA specifications with Tifway II Hybrid Bermuda fairways and tees. Over 800,000 cubic yards of earth were moved to create the dramatic elevation changes considered impossible on the Las Vegas Strip! 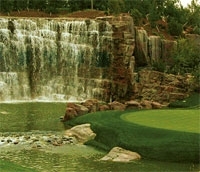 The Wynn Golf and Country Club landscape includes over 100,000 new shrubs, 4,600 lineal feet of stream, a 37-foot water fall adjacent to hole 18, 45 feet of elevation change from the tee of Hole #1, two marshland areas using natural groundwater, nearly 6 miles of cart paths and roughly 1,200 existing trees were salvaged and relocated from the former Desert Inn Golf Course, some more than 50 years old and over 60 feet tall. ADDRESS 3131 S. Las Vegas Blvd.